Gfest: Third Batman Film Gets a Title, and Nolan Confirms That the Riddler is Out. Third Batman Film Gets a Title, and Nolan Confirms That the Riddler is Out. Christopher Nolan’s third Batman film will be called “The Dark Knight Rises” and though Nolan isn’t ready to reveal the villain of his 2012 film, he did eliminate one member of Batman's rouges gallery: “It won’t be the Riddler,” Nolan said in an exclusive interview with the Hero Complex. Nolan, who is notoriously silent lipped about his movies, caused quite a stir with the elimination of Edward Nigma, the Riddler, who many people assumed was the next natural choice. This is a bit of a disappointment to us, as we were thrilled to have Nolan erase the painful memories of Jim Carey's ridiculous portrayal of The Riddler in the old Batman films. But Nolan has earned the right to do anything he wants in the next Batman film based on how well he has handled Batman Begins and the Dark Knight. The title shows the writer-director’s intention to keep his Bruce Wayne trilogy tightly stitched together. “We’ll use many of the same characters as we have all along, but we’ll also be introducing some new ones,” Nolan said cryptically. 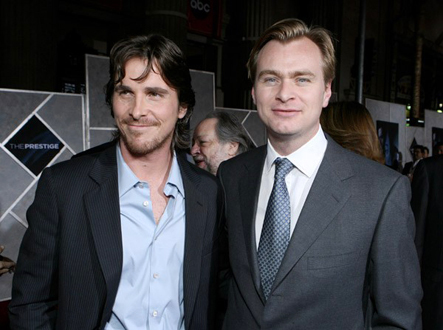 Nolan is clearly the man in charge on this film, which is nothing but a good thing in our book. He could put Firefly in the movie, and we'd probably all end up thinking it was cool. At the end of the day, we're OK with whatever Nolan's vision is. He's earned that level of respect. Besides, we've thought all along that Two Face would probably be the villain in this movie, and as other potential rouges keep getting eliminated, that seems more and more likely. What is riddler doing to batman? I don't think I like that riddle. Two-Face is dead. The "Dark Knight" script says so. I'm hoping for Hush. No one is ever dead in the world of superheroes. Hush would be awesome but too many non comic readers would just be like, "wtf?!"